London, UK - 24 June 2013: Australian contemporary circus Circa and British vocal ensemble I Fagiolini presents their show ?How Like and Angel? at St Bartholomew the Great church in East London as part of the Beyond Barbican summer programme. 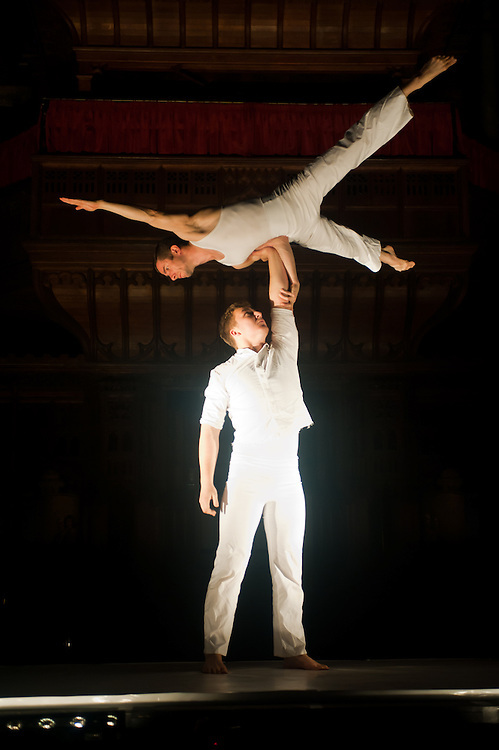 Acrobatic set-ups are performed by Gerramy Marsden and Paul O' Keefe. Circa Circa and I Fagiolini I fagiolini acrobatic acrobats australian beyond barbican barbica britain british collaboration contemporary circus contemporary music east london event how like an angel london media view performance physical pop-up premiere press night press preview production renaissance st bartholomew the great tour uk vocal ensemble west smithfield reportage photo reportage photo reporter features reportage photography reportage photographer documentary photographer documentary photography editorial reportage photographs photographs image images picture pictures photo photos project photoproject photo project photograph photographs event photographer event photography events photographer events photography event photographer london events photographer london press photographer london press photography london press photographer news photographer fotografo a milano fotografo milano fotografo milano centro fotografo lombardia fotografo "milan photographer" "photographer in milan" "photographer in bergamo" "photographer milan" "photographer milano" "photographer in milano" "italian photographer" "photographer in italy" "photographer in lombardy" "fotografo a como" "fotografo a pavia" "fotografo a bergamo" "fotografo a trieste" "photographer trieste" "fotografo di milano" "fotografo a milano" "photojournalist in milan" "corporate photographer" "event photographer" "fotografo di eventi" "fotografo di eventi milano" "photographer in bergamo" "photographer in trieste" "event photographer milan" "milan photographer"